Melbourne digital marketing agency Moo recently completed the development and design of the latest Kairros website. Kairros provides occupational rehabilitation services for injured people, employers of injured people and insurers. The company has quickly grown from a boutique Sydney service to a significant Sydney and regional NSW service provider. To meet its customer service and business development needs, it needs a high-performing website. Moo’s marketing professionals consulted with Kairros management and marketing to gain a thorough understanding of their markets and market segments. 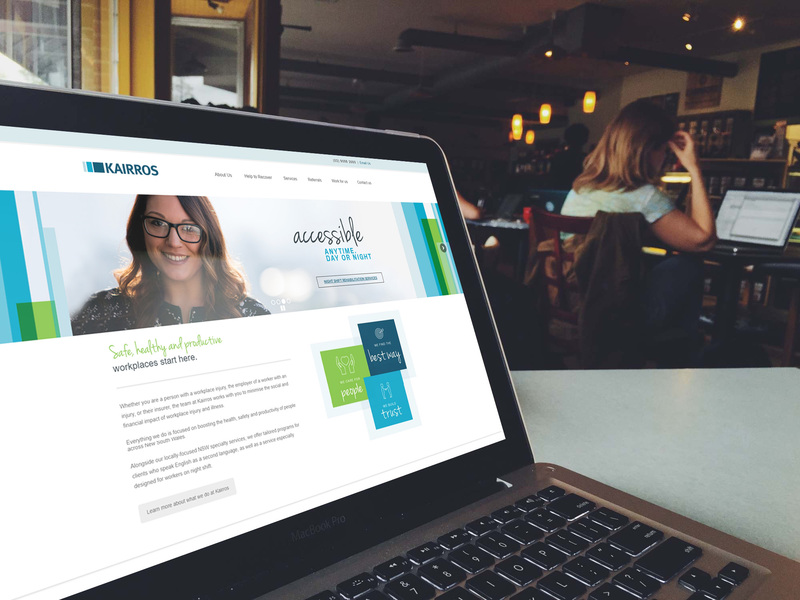 With buyer behaviour in mind, MOO Marketing Agency Melbourne developed and designed Kairros a website that synchs seamlessly with Kairros’s marketing and business growth strategies. As an end to end marketing and graphic design agency we were able to implement a true digital marketing solution website powered by WordPress as the content management system. We optimised the website for search engine rankings and set up Google Analytics for marketing control purposes. We ensured the website was responsive across all devices, proven across all browsers and adherent to security standards. Moo’s digital marketing staff also developed a new sitemap. We improved the webpage structure and produced richer content for various pages – including About Us, Services and Referrals. As a well-respected Melbourne digital marketing agency, Moo offers the full suite of services its clients expect. These include copywriting, website design and development, email marketing and social media marketing. Given Moo’s substantial expertise across a variety of content management systems (CMS), Moo was a logical agency to service Kairros’s website needs. The Melbourne digital marketing agency is a leading designer and developer of WordPress sites for businesses of all sizes. WordPress is the clear choice when it comes to digital marketing solutions. The CMS now powers almost one third of the web today. DIY blogs, small business websites and major multi-nationals all value its ubiquity and flexibility. Moo Marketing and Graphic Design Agency understands exactly why a company website and landing page is a business’s essential platform to promote their value to consumers, staff and stakeholders. The Kairros website is a great example of a website that can deliver positive outcomes for the client’s target market and business development. If you have a business that could benefit from the power of a new or improved website, get in touch with Moo for a full digital marketing solution. MOO Digital Marketing Agency Melbourne Website Project – Kairros WordPress Website. Please contact us for all your WordPress website design and development needs.